What are the secrets of Lean leadership? Big news: There aren’t any – at least not any more. As recently as 20 years ago, nobody understood what Lean leadership was and what steps one needed to take to become a capable Lean leader. 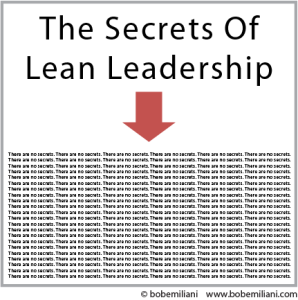 Lean leadership was a mystery, its hundreds of secrets shrouded in a dense fog. No more. In those early days, everyone was interested in Lean tools. But a few people were more interested in Lean leadership, including me. So I went from my own practice of Lean leadership in industry to developing a 20-year scholarly agenda in academia studying Lean leadership whose purpose was to lift the fog and reveal the secrets. Others followed. Together, our observations and research, carefully documented in scholarly papers (see my papers here) and in trade books (see my books here), have turned the secrets (i.e. tacit knowledge) known only to a few into information (i.e. explicit knowledge) that is openly knowable by anyone. In addition, we now understand the reasons why leaders resist Lean and what to do about it. The result of a few million dollars spent on researching Lean leadership is affordable books and online courses. This work has turned out to be a great success. While enormous progress has been made in only 20 years, a challenge remains: It is to motivate leaders steeped in 30 year of conventional management thinking and practice to want to learn new ways of thinking and doing things. In addition to that fundamental challenge, we also need to help them overcome the implied threat of Lean management and recognize that Lean is how they should be leading and managing the business in the future. 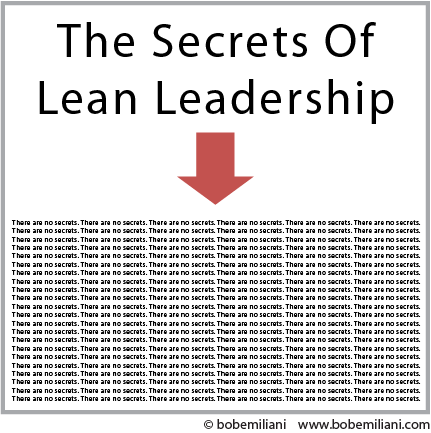 We must also help top leaders to understand that Lean is a more responsible and ethical way to lead a business. I described this in REAL LEAN (Volume Four, Chapter 9), “The Ethical Management System.” And we should help them understand the potential of Lean to create a better future.